This years edition of SAIC’s annual behemoth was as sprawling as ever. 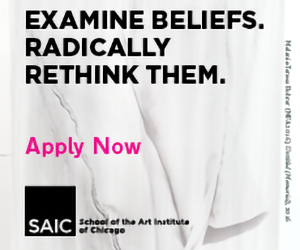 Each person’s account sounds like a completely different exhibition than others, but I think we can all agree that SAIC is “on trend.” If we covered every piece in the fair MFA show this column would never end. Within the leviathan there were a few clear winners, and who wants to hear about losers anyway? If you missed Andrew Holmquist‘s video you need to return to go and start over. Immediately on your left as you walk into the Sullivan Galleries, Holmquist’s video is reminiscent of video work by Alex Hubbard, flattening the world of objects into the two-dimensional register of his paintings (and maybe a little bit of the reverse). Shining Shimmering Splendid from Andrew Holmquist on Vimeo. From the exhibition Temporal Figuration at LVL3. 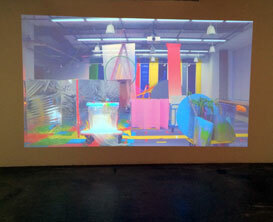 In a similar shorter video piece, Shining Shimmering Splendid, shown recently at LVL3, Holmquist can be seen positioning the objects in a pair of black high heels and a sheer aquamarine raincoat. In Painting Space and Time at the MFA show objects (mostly) appear to be propelled by an unseen force, leading me to imagine the Rube Goldberg contraption of Fischli and Weiss’s The Way Things Go in Technicolor. Despite the conjuring of a million references, the color, light and sound are distinctly Andrew’s own, bringing his painting practice into time and space in a imaginative and captivating way. Naama Arad‘s Bahad 1 was another personal favorite. Made simply from perforated xerox prints and tape the work was more impactful than a robot or any number of gigantic fabricated tongues. The hanging shifted subtlety as the sun set downtown, and mingled effortlessly with the throngs of visitors to the exhibition. The title of the piece, Bahad 1, takes it’s name from the training bases of the Israeli Defense Force, the first of which is a well known school for training officers (according to Wikipedia). Rather than a geometric abstraction, the large scale print is an image of the old synagogue at Bahad 1, designed by Zvi Hacker with Alfred and Naomi Nueman in the late 1960s. Who knew the Bauhaus was so prominent in IDF architecture? Is Arad’s lattice something more sinister? We hope this promising artist doesn’t leave Chicago too soon after graduation, we want to see more. 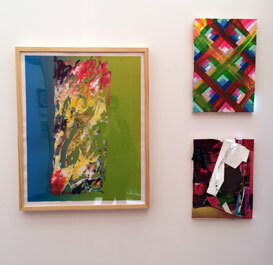 These works and a whole lot of other stuff is on view at the SAIC Sullivan Galleries until May 14th. The shows tumblr-ish website isn’t half bad this year either. Painting MFA Caleb Yono and friends making a scene at Sullivan. The crowd through McKenzie Thompson’s installation. 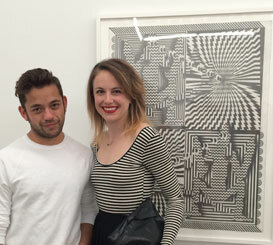 Thompson (right) with SAIC Curatorial Fellow, Alda Tchochiev. 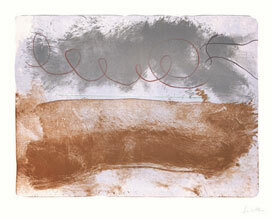 Helen Frankenthaler, Vuillard’s Chariot, 2006, Lithograph in 7 colors on Rives BFK paper, 24 3/4 x 30 1/8″. The Franklin, the sukkah-looking gallery located in Garfield Park, is one of the most thoughtful and innovative exhibition spaces in all of Chicago (it’s also the coldest in the winter). 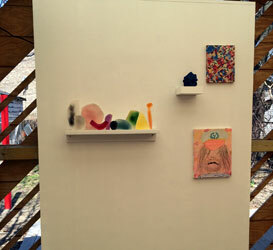 The stylized outdoor exhibition space seems to effortlessly adapt to the demands of it’s exhibitions, ranging from solo shows to large group exhibitions featuring dinners, bonfires, black metal and, of course, Edra Soto’s signature pineapple upside down cake. 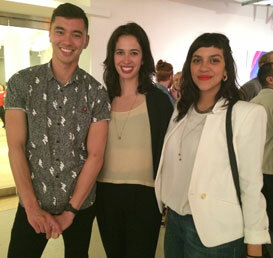 Work by Leslie Baum, Radames Juni, Easton Miller and Candace M. Briceño-Connolly. 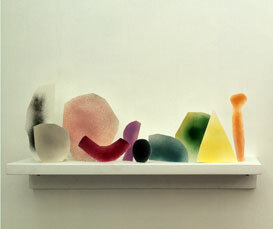 Closeup of work by Leslie Baum. Soto, who built the gallery in the back of her home with partner Dan Sullivan, does far more than just bake cakes. The gallery is clearly the result of her love for art and the joy she experiences sharing it with others. 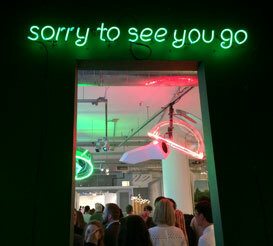 Chromatic Consortium, which closed this past Saturday, was a prime example of Soto’s broad range as a curator. Only Edra could (or would) pair paintings by her students at SAIC with work by artists in the Whitney Biennial and make it work. 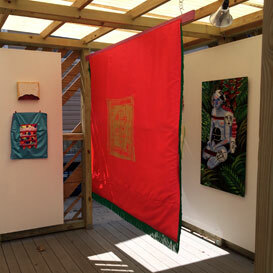 Works by Ryan Richey, Lisa Alvarado and Iryne Roh. As Soto toured me through the exhibition it became apparent that what really binds the show is her relationship to the artists and her genuine interest in their process and production. Each artist has some personal connection to Soto, or she admired their work so much she decided to contact them cold. Who could resist Edra’s big smile and warm heart? She discusses a portrait made by a second year student with the same reverence as any #WhiBi artist. The consideration for each work position relative to the small space makes the exhibition click without feeling overcrowded. 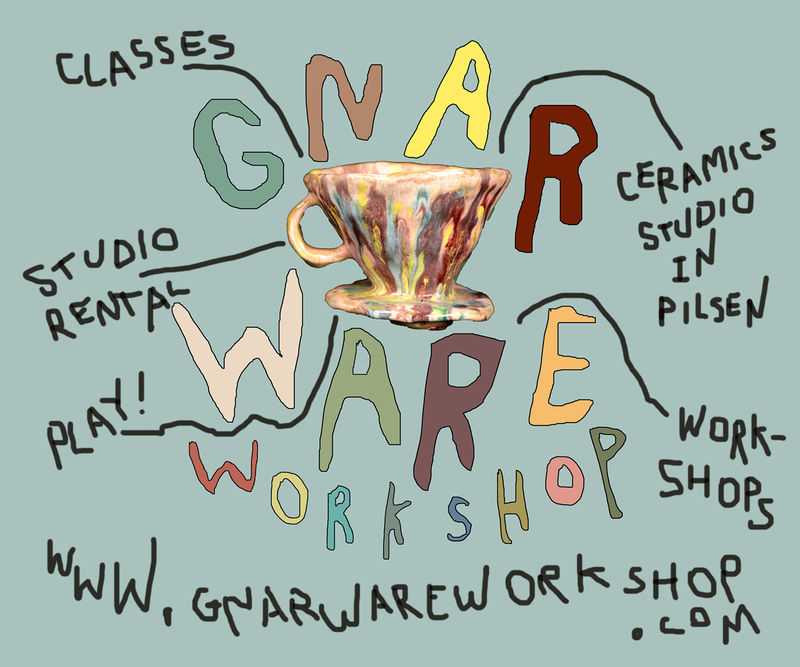 Work by Leonardo Kaplan, Maya Hayuk and Mara Baker. If you missed this show then we’re sad for you, but all is not lost. For the Franklin’s next exhibition Soto is teaming up with the firebrand Sabina Ott (proprietor of her own experimental ourdoor space– Terrain) for SCAPE with work by Alison Ruttan, Alex Tam and Assaf Evron, Joe Jeffers and Ott. The exhibition opens this Saturday, May 3rd at 6pm. Praying for no rain, but as Edra pointed out to me, nothing can dampen The Franklin or the art inside. 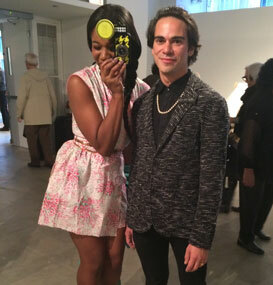 Having a blast looking at @RobinDluzen and @AbrahamRitchie gallery crawls (including SAIC's MFA) from last night. you guys rock! Honorable mention to Dan Gunn’s Instagram. 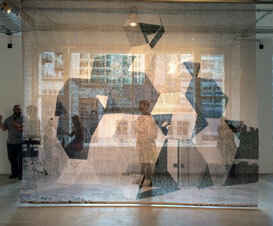 Header image features a detail image of Naama Arad’s Bahad 1, on display at the SAIC MFA Exhibition until May 14th. The lovely Ashley Drapes with Daniel Romeu. What’s Black and White with Red lips? Gan Uyeda, Raven Munsell and Sharmyn Rivera. 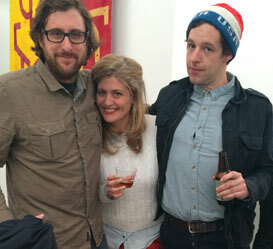 Meanwhile in the West Loop: Ryan Travis Christian with Mike Rea and Heidi Norton at Christian’s exhibition Check Please! at Western Ex. The drapes match the curtains at Check Please!